Working from the premise that tire pressure dictates ride quality, a pair of German companies have joined forces in the development of an inner-tube system that optimizes both cornering and grip. 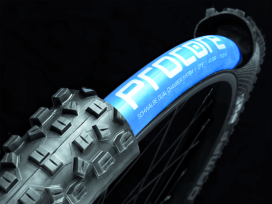 Tire and rubber manufacturer Schwalbe developed its Procore technology in conjunction with accessories specialist Syntace and the duo is introducing its dual-tube construction and compatible rim for the 2015 model year. Schwalbe’s Procore system features a tube running along a tires central channel that inflates at lower pressure, allowing for optimal grip on uneven surfaces. Meanwhile, a second valve permits is inflation at higher pressure near the tire bead, firming sidewalls to improve cornering and prevent the flats that are common at the reduced pressures utilized in mountain biking applications. Taken together, the Procore system permits an average minimum pressure of 14 lbs. per square inch; far lower than the 20lbs/psi minimum recommended for MTB tires. Based in Germany, Schwalbe developed the system to work with any tire or rim, provided it features a minimum 23mm width. However, it enlisted Syntace, a company based in the Bavarian town of Tacherting that had been working independently on a similar system, to provide rims with holes for two valves that accommodate the Procore system. Both makers say the higher inner core pressure reduces the risk of dented rim on rough terrain.